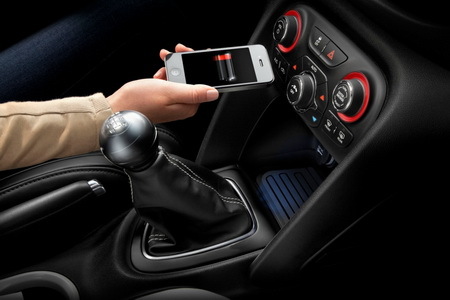 Today Chrysler announced that it would offer in-vehicle wireless chargers. The device, which comes out of Chrysler’s aftermarket division, Mopar, will be available for the 2013 Dodge Dart, which will debut in the second half of 2012. The accessory feature will retail for $199 plus installation. When installed, it is seamlessly integrated into the bin that sits in front of the center console, underneath the head unit and climate controls in the center stack. The unit will come with a special phone case that will allow your device to be charged whenever the vehicle is on.